Your pup is probably really excited that it’s finally summer – no more being cooped up in the house all day, it’s time to hang outside! While it’s great for your dog to get some fresh air and extra exercise during the summer months, it’s also important to make sure that they’re safe and healthy since the warmer months can cause a few health concerns. As Web MD notes, if you’re overheating, your dog is probably overheating too – heat stroke is not just reserved for humans! If your dog’s body temperature rises above 106 degrees, which is a distinct possibility on a warm summer day, your dog is likely to be at risk for heat stroke. Signs and symptoms include panting without relief, fatigue, vomiting, diarrhea and even seizures. If your dog seems lethargic or fatigued, it’s time to head back inside and soak up some air conditioning. Avoid using ice in your pup’s water or on the body – that’ll cause blood vessels to constrict, which can exacerbate heat stroke. Provide your dog with room temperature water and call your vet. If you usually take your dog out for a walk during the hottest hours of the midday, try changing up your routine so that you’re outside when it’s a bit cooler, like early in the morning or in the evening. Not only will your pup be more comfortable in the lower temps, but you will be too! Avoid trimming your dog’s hair too short during the summer. While it may seem like a short haircut will keep your pup cool, the fur actually acts as a body temperature regulator. Hair that is too short can also make your dog’s skin more vulnerable to sunburn. Dogs get thirstier than humans do when they are hot. Besides panting, drinking water is the only way that dogs have to cool down and lower their body temperature. Whether you’re out for a hike or running errands, make sure you always have fresh, room temperature or cool drinking water for your pup to refresh and stay hydrated. 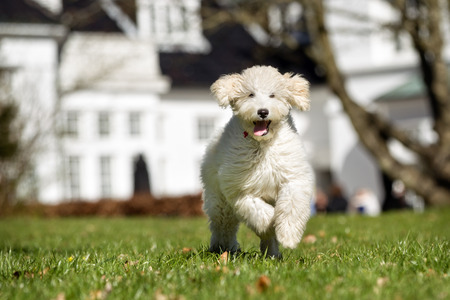 For more tips to keep your dog safe during the summer months or to find out how you can make one of our labradoodles your own, call Jubilee Labradoodles today at 517-467-6811 or 517-902-9808. ← Sunburn – Not Just a Risk for People!